I like to mess around with data. If you’ve been reading this blog for any time at all, you can see that is true. Since I’ve been doing player analytics, I started looking at different statistical profiles of the European leagues to analyze whether they are truly comparable, and on the whole they match up pretty well. The stats in one league look approximately the same as those in other leagues. This is good, because it lets you shop across leagues for interesting players to recruit and have some comfort that they will be playing the same game, and probably produce a similar statistical performance. Serie A is weird. It has a lot of strange statistical wrinkles that just don’t quite line up with what you expect in the rest of the leagues. Take the Interceptions stat, for example. The numbers produced for Ints in Serie A look similar to what you see in other leagues, but look at the difference in positions for who intercepts the ball the most. 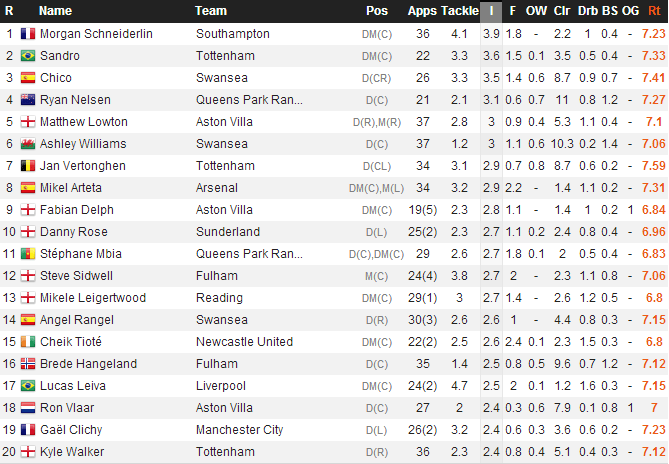 This list is mostly dominated by defensive midfielders and full backs, with a few rare central defenders in the top 20. This is very similar to EPL. 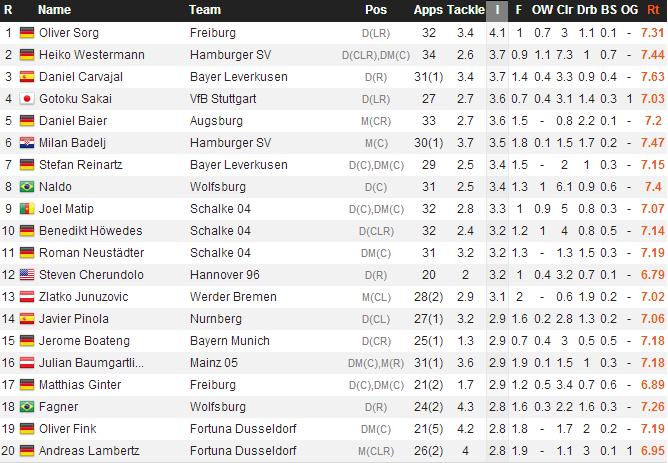 Defensive mids and fullbacks again dominate the Int stat in Germany. Uhh… what happened to the midfielders? And the fullbacks? Why in the world is this list all center backs? I picked Michael Cox’s brain (Zonal_Marking) a bit about Italian defending recently, and he confirmed a hunch I had that almost no teams in Serie A press heavily. Is that enough to produce a statistical skew like this? I have no idea, but it certainly has my curiosity piqued. 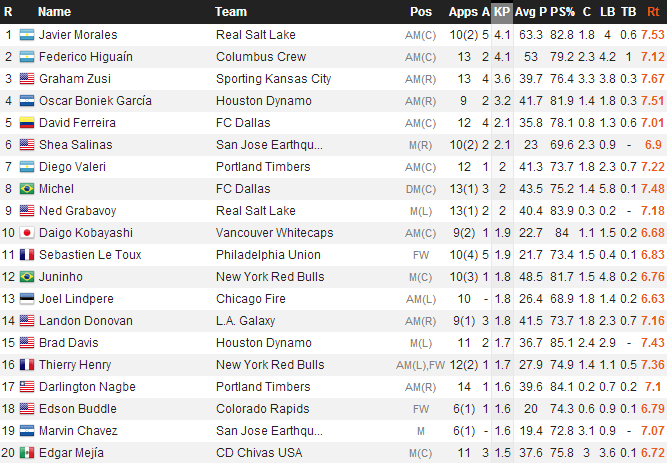 While we’re on this particular stat, check out what I found when poking around MLS yesterday. WHAT?!? Djimi Traore averages 7 interceptions a match? 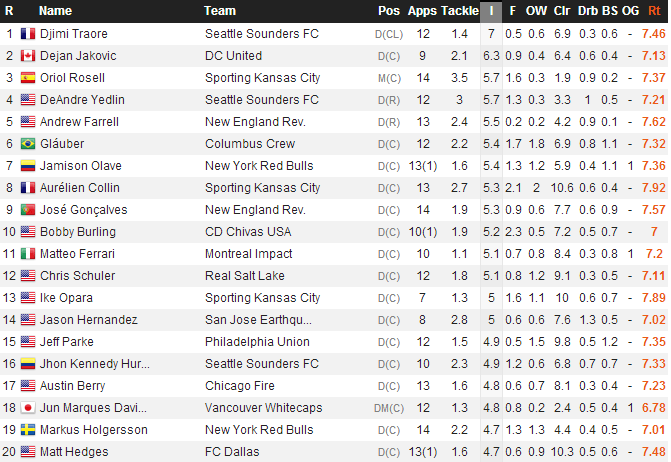 And all of the Top 20 in MLS average more Ints per game than anyone in Europe? I’m honestly wondering if two columns have been added together here, because while I know MLS teams tend to complete fewer passes, that sort of inflation seems insane. Then again, the game might just be that different. Speaking of MLS, check out this comparison. The first picture is the Key Pass sort from the Premier League. 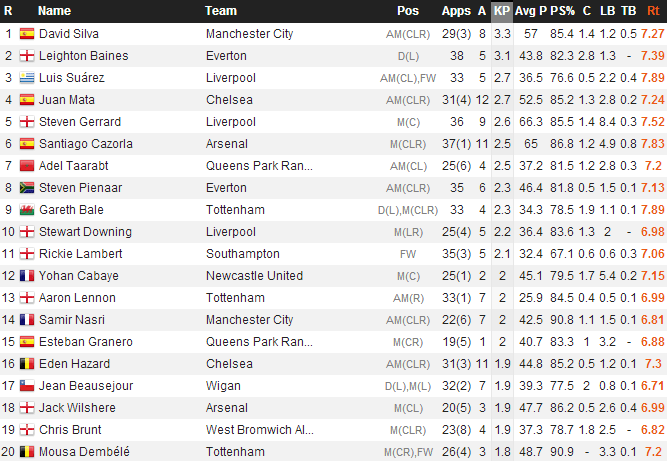 David Silva’s 3.3 actually lead Europe this season. Three guys in that list are averaging more than Silva. I don’t know what to make of it, but I found it interesting. I also mentioned yesterday that Graham Zusi was perhaps the only offensive player in MLS that I would be immediately interested in if I were a European club. This was the reply from Sporting Kansas City’s performance analyst. Tough but fair. Hey Rui… while you’ve got him, try to up the shots on target percentage, a bit. 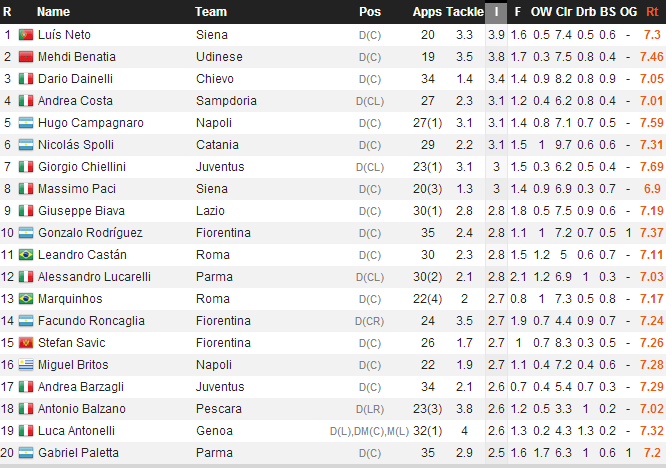 Everything else in his game looks great :D.
Ints isn’t the only way that Serie A is strange statistically. Maybe I’ll do another one of these sometime soon to discuss the other things I’ve found. As for MLS, you actually cannot compare defender Int numbers there to anyone in Europe because they are so incredibly different. Yet another issue to overcome with statistical scouting.